Box kites come in so many different types these days! You don't have to see many of the ads these days to realize that. In fact, the term is used rather loosely now. It almost means the same thing as 'cellular kite'. The creativity in designing kites these days is amazing. Some are designed to fly stable, others will tumble if you release the line tension for a while. Flying boxes with small wings are more stable and have even more lifting power than the traditional box. Some look nothing like the traditional square designs. A cellular design called 'snowflake' is a good example of that. Cellular kites are made up of many hollow cells, stacked next to each other. In these designs, the cells don't necessarily have flat sides. I've seen examples of hexagonal kites that gently rotate on their axis as they sit in the same spot in the air. Others have parts that slowly rotate in the wind. There must be dozens of unique designs around now, and who knows, that might turn into hundreds or thousands in years to come. Check out this Traditional Box Kite from Amazon. The list below shows where the modern box design has come from. Despite that, plenty of people still fly these designs for fun! In some cases, these kinds are still being used for practical purposes too, like hoisting cameras or ham radio aerials. The main features were the 2 long straight spars running the full length of the kite, the diagonal braces which made the whole structure rigid, and the flat cloth sails giving it the unmistakable 'box' appearance. The so-called traditional box came about after somebody simplified the Hargrave design. Also, it's square rather than rectangular. The traditional design only needs the 4 main spars and 4 diagonals, plus the sail material. An interesting historical example is the so-called box kite, which was used by downed air crews during the Second World War. In flight, the Hargrave looks a bit like a biplane, but the traditional square design flies on one corner. This is because the bridle attaches to just one of the spars. Both modern and historical Codys are like 2 box kites side by side, with some extra vanes and winglets added for more lifting power. The idea behind this design was to make something that performed just like a Hargrave, but with even more stability and control. I've put together a little research on the original, in case you're interested. The Cody Pro Box Kite is available from Amazon. Although the first box kites were rectangular, similar kites with 1 less or many more main spars will still fly. In the case of 1 less, that makes a triangular box kite. A simple triangular design looks and flies very similarly to the traditional square box, with the bridle attached to one of the main spars. They take a bit more breeze to fly though, for the same size kite. The is often modified with the addition of wings, to make it a more efficient lifter. Sometimes people suspend cameras, or even scientific instruments. Ham radio enthusiasts still use the to hoist long aerials into the air. Ok, what about adding more spars... A few kite designs these days are based on the hexagonal concept. Yes, 6 main spars! The whole thing starts to look less like a box and more like a barrel. The pic over there on the right shows a design pretty close to a traditional hexagonal kite. It's by Helen Howes, a pro kite maker who runs the charming little site in the U.K. In theory, you can have as many spars as you like. In fact, it is possible to go all the way and make a circular kite that looks like 2 wide pieces of tubing floating in the sky. Some like to rather than pick up a retail Box from the local kite shop. The traditional square Box is not difficult to make, but does take considerably more time than a similar-sized Diamond or Sled. Keen for an even more complicated kite? Why not try a 4-celled made from bamboo skewers and plastic! Or even stack these together to make a big 16 cell or a massive 64-cell kite! Not many box kites these days are used for scientific or other practical purposes, at least when compared to how many of them are being flown for fun! The latest designs get shown off at kite festivals, and then sold off through kite shops both real and 'virtual' on the Internet. 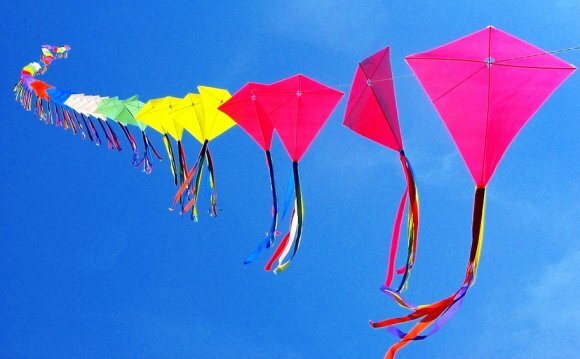 Since the whole idea for most of these kites is to look at them, it's not surprising that lots of bright colors are used in the designs. Here's a few examples, one for each category in the list above. An interesting variation on the basic 4-spar design is the Explorer Box. Despite the classic 4-spar construction, this kite has triangular panels that give it a really unique look. It's designed so the bridle can be easily attached to any spar. This gives 4 different looks to choose from, when flown. Like many modern kites, the spars are fiberglass and the sails are rip-stop nylon. A typical example of merging the basic box with other elements is the B-Box beginners' kite. This one is based on a triangular box actually. The addition of simple wings and 2 tails makes it a nice easy stable flyer. It handles gusty winds well. Easy to set up, and also made from ripstop nylon with fiberglass spars. How's this for a cellular kite which Lawrence Hargrave would just shake his head at I think. The Lotus Box is a spectacular-looking kite with many triangular cells arranged in a circle, with extra sails on the outer rim. Look closely, and you can spot the basic triangular box kite in there! So it really is a box design. With so many spars, the manufacturer has made them out of graphite to keep the weight down. Here's a good example of special behavior. The cleverly designed HQ Roto Kite rotates around it's axis while maintaining it's position in the sky. Eye catching hey? According to the makers, it's a 'a reliable flyer with light pull'.